When you’re young and in love you do stupid things. Darrin had just started dating Julie, the girl of his dreams. He was totally besotted and found himself roped into seconding Julie’s mom, Diane Keys (BN3381), at the Two Oceans Marathon. The way to a man’s heart may be through his stomach but Darrin knew that the best way to impress his prospective mother-in-law was through his legs – and took up running. Already head-over-heels in love, Darrin figured it made sense to throw his calves, hamstrings and quads into the equation as well. 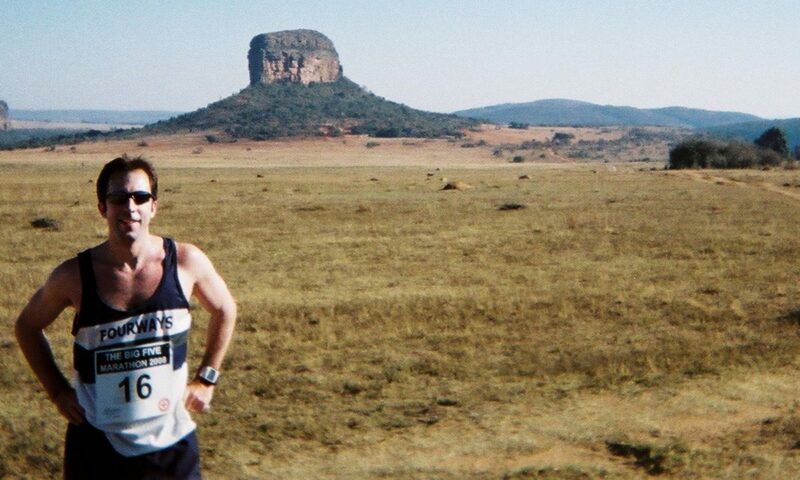 However, like many of his gender, Darrin’s fear of commitment meant his Two Oceans relationship began tentatively – testing the waters with three half marathons before deciding to take the plunge and run the ultra. 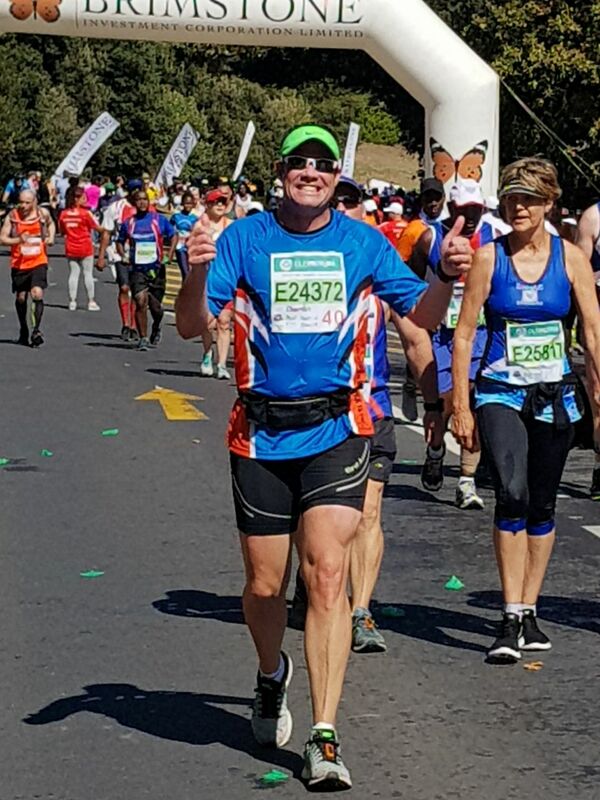 With nine Two Oceans Marathon finishes under the belt, Darrin hopes to finally put a badge on this love affair by earning his permanent Blue Number when he crosses the finish line this year. Like any sensible husband Darren admits his wife is the smart one in the family, sticking to the half marathon (Julie will be running her 5th this year). Having lured Darrin into ultras, mom-in-law Diane is now working her way towards a second Blue Number on the half marathon – and this year the race is held on her birthday so it’s going to be an extra special one. On top of this, his brother-in-law Cornelius is joining him on the ultra and his wife, mother-in-law, father-in-law and sister-in-law are all running the half marathon – so for them it’s a case of #RunAsOneBigHappyFamily. 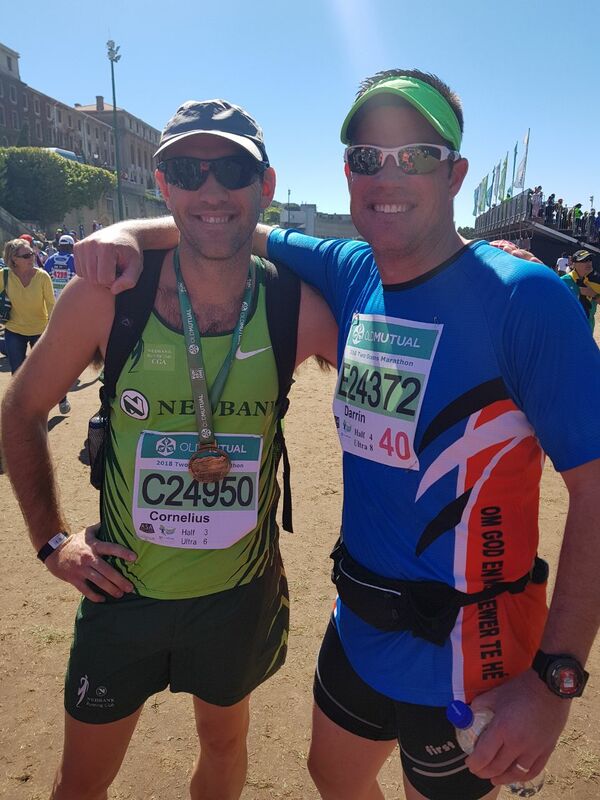 Darrin savours another Two Oceans Marathon finish with his brother-in-law Cornelius. Having made an annual trip from the highveld to the Cape since the turn of the century, Darrin and Julie’s kids know only of an Easter Bunny that lives in Cape Town (and one with tight hamstrings who tends to hide all the eggs at waist level and above)! Darrin and Julie’s kids love their Easter holiday in the Cape which is a good thing because, with this family’s tendencies, it’s likely that their grandkids will be doing the same. Advice for other bronze medal hopefuls: First and foremost – make sure you have FUN. Running with friends, club mates or family is always a laugh. Engage with other runners along the route about their names or club. This is easy to do in the first half and very hard in the last 10 km (when you’ve had a total sense of humour failure). One of my favourite chirps is stopping at a spectator and telling them “Can you believe I actually paid money to do this to myself?”. Don’t rush down to Fish Hoek and burn the turbo. Chapman’s Peak is hard and it will hurt you – so go slow. Enjoy the scenery which is an obvious one, but when you’re battling up Chapmans – it can be a great distraction. Listen to solid advice from seasoned runners – they know what is coming around the corner. Pre-race routine: Get to the race early. Rather wait in the car than stress in the traffic. It’s an a early morning regardless, so an hour less sleep will not really matter. One year we got caught in traffic coming from the Blouberg side. The traffic was at a standstill and time was running out, so we jumped out of the car on the highway and started to run to the start line. The traffic then moved and we jumped back into the car and finally got to the race totally nakkered. Best part of the race: I really enjoy the finish, it’s the where all your training and battles, including the self-arguments get settled, once and for all. You are a champion and you did it! Worst part of the race: “Death valley” – the section before the marathon mark. It is usually very hot and supporterless. I’m a social guy and love people. Getting there is like eating razor blades. Most memorable race: In 2012 it poured with rain, so much so that when we went through Simonstown the water was level with the pavement – it was like swimming the Two Oceans. It was so cold that day that we ran hard just to keep warm – and I ended up running my fastest time. When we finally got to the finish, the mud was so deep that people were literally losing their shoes in the field. Top tip: Don’t get caught up in the hype – stick to your pacing chart or game plan. Fly now – pay later! 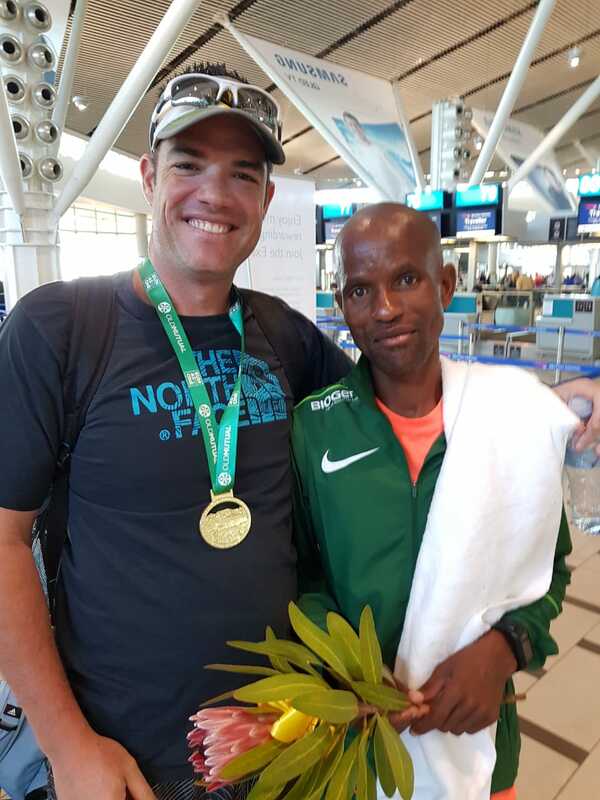 Darrin tries on Moeketsi Mosuhli’s gold medal for size (Moeketsi runs for Nedbank Lesotho and finished 8th at last year’s race. He has six OMTOM golds with a best place of second – achieved in 2010). Well disciplined on the road and at the office – An inspiration to all ! !